Burberry’s event was very exclusive, upon walking in and viewing the room full of suspiciously well dressed ladies and gentlemen, I knew I was about to learn something to “fit the occasion”. While waiting for Gianluca Negrini, men’s division supervisor, to join me I had a moment to taste Canestrari’s Valpolicella Superiore Ripasso. A very nice wine to begin the experience. Once I had Gianluca’s undivided attention, he introduced me to their tailoring specialist Guido Ciarfella. I couldn’t stop listening to his explanation about this project, which basically helps men to see exactly how they can be fitted perfectly. The right choice of fabric, color and suit style, of which they have three defined fittings: slim, modern, classic. My very favorite detail about the new line is that, although the brand is English the suits are “Made in Italy”. Guido also showed me the new travel collection! Amazingly he scrunched the sleeve up into a ball and it didn’t wrinkle – not even a crease. This patented weave is 100% wool, perfect for the traveling business man. I wanted to taste one more wine before leaving, so I found Katia and she suggested the Amarone 1888 and ohhhh is it heavenly, it has a history in Verona like the Arena. In fact, I’m sure in 1888 everyone drank Amorone della Valpolicella before going to the opera. 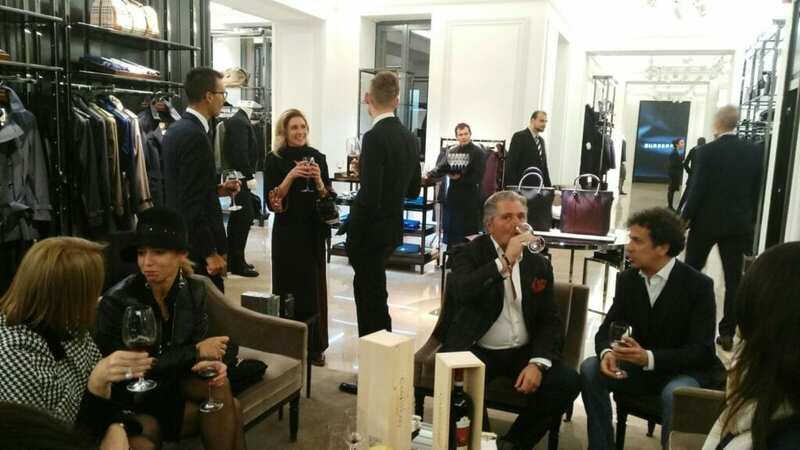 Many thanks to Burberry General Manager Giuseppe Colucci for inviting MilanoStyle.com and me to the exclusive and luxurious event.